I traveled to Rwanda during the month of June, primarily teaching English at a primary school and volunteering at a hospital. TAILOR MADE TRIP: Chase Taylor ‘12, a government major with an international relations focus, traveled to Uganda and Rwanda this fall. Molly Pallman studied in Buenos Aires, Argentina. "I went down with IFSA-Butler and they had it set up so you just basically enroll in different universities...Pretty much the whole thing was just amazing. I played for a Frisbee team there and they ended up being my closest friends—mostly Argentines and Colombians. So I guess my favorite memories are the team parties we would have—the way it goes until 5, 6 a.m. It was really hard to adjust to...I stayed in two different homestays. I would eat dinner at around 9 or 9:30, then you go out at midnight to a friend's apartment to hangout, pre-game, and whatever. And then at 2:30, that's when things started picking up...you would be out until 5 a.m. or 6 a.m. and go somewhere to eat breakfast with friends and you would get to bed by 8 a.m.. So it was rough—but it was fun." "I lived with an Orthodox Jewish family, so it was an interesting way to see Judaism in general. I'm Jewish, but not very religious. Seeing that degree of Judaism and living in a home [that was] only Kosher—I wasn't really aware of the Jewish population in Argentina. So that was interesting. Also, the constant political participation all through[out] the city really struck me—protests, strikes, all the time. I almost didn't get out of the country because protestors burned and barricaded paths to the airport." Heather Kinnear hiked the Appalachian Trail. "But I started walking. The first part was hard. It is a beautiful area, so it was really worthwhile, and I met people along the way and it was cool talking to them. It was a challenge, physically and mentally, because you're alone...You have to keep a steady pace. So I was pretty beat coming down Katahdin, but the next day it was like "Let's get up and hike 15 miles," and the next day I was like, "Let's go 20," which hurt, but it's what had to happen. My body broke in gradually. "I finished November 12 so I pretty much walked pretty steadily that whole time...I'd always kind of wanted to do it...I just kind of put aside the summer after sophomore year as 'I think this is the time to do it'...some part of me had committed and I really wanted to go through with it." Antonio Watson studied abroad in Madrid, Spain. "You have the opportunity to take classes at the University of Madrid, which is actually one of the top five universities in Europe, which was really a great experience for me. I took a fifth year psychology course that was very challenging and, to be honest, I can't say that I honestly learned too much because Spanish semesters are a lot different than American semesters. So, theirs started in October and it goes until February, and so I couldn't start classes until almost a month into my program...I only got a chance, overall, to go to about six or seven classes...In general being in Madrid was really, really great because being in Europe, it's just so metropolitan, you have the opportunity to go to so many places...So there's kind of the opportunity to visit all these world locales that a bunch of people have these dreams and fantasies of going to. So having that opportunity was really, really special." "My program courses were very manageable and I was happy that it was like that because I got to appreciate my experience a lot more because I wasn't spending all of my time doing work. I got a lot of opportunities to go out and see the city of Madrid, especially because I was there for so many weekends and I didn't travel as much as other people did. I really felt immersed in the Madrid culture. I got a library card and felt like I was from Madrid...it solidified my experience of living there...Being away from Bowdoin made me realize how much I really enjoyed being here." 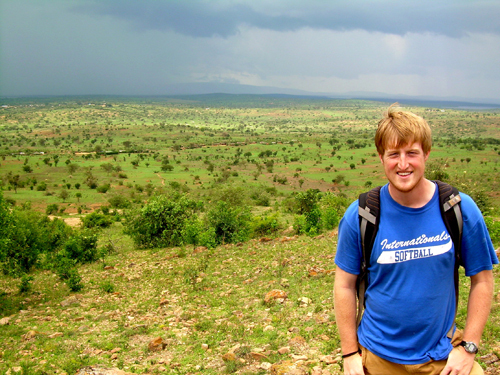 Chase Taylor spent a semester in Uganda and Rwanda. "I was in Uganda and Rwanda on [a] post-conflicts study abroad program and I was looking at the genocide in Rwanda and the recovery from that and the LRA war in northern Uganda and the recovery from that. So I was staying with families while I was there and taking classes with senators from Rwanda and Uganda...The last month I was there I did an independent study project and I was researching Rwandan refugees' and Southern Ugandan refugees' settlement and their lives." "[I chose] Uganda and Rwanda because I know a lot of people do the Europe study abroad experience and I spent some time in Europe as a kid. I grew up there; I spent five years in London...So I wanted to do something a little different, especially with a [government] degree with an international relations focus, I thought it would be a perfect place to go. It worked out really well. It's just a totally different world than what we're used to: different culture, different food, different everything."